. . . and babies make four. 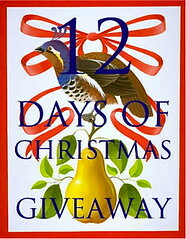 : On the tenth day of Christmas . . .
Before Michal and Kenna started Kindergarten I tried to think of a way I could help their teacher easily identify who was who and then I found these darling hair clips from Details. Detail makes flower clips and dot clips. They make clips with names and clips with initials and even clips with fun words like giggle. And all their clips are made with high-quality wool felt in yummy bright colors with great hand stitching. Details is offering one reader any clip of their choice. You literally have the run of the store and can pick out one clip in any style. (The only thing that is off limits is the bird bow holder.) Just go visit their store, pick out what you like and then come back and tell me about it. This giveaway will stay open until December 16 at 12:00 midnight. I love them all, I would choose the bubblegum pink personalized one! The clips are so cute, but Marissa's easily pleased...anything pink and personalized brings her a smile! any of the Christmas and I love the ones that say giggle and imagine! Just too cute! Must order some! I love the monogramed clips you have pictured on your post! Very sweet! I'll take one of each, please! I really love the round monogram but I also love the personalized ones with the scalloped edge. I will have to say I just adore the giggle one in pink! It is too cute. Love these! They are such a great idea. I love the twinkle clip! I know it's under the Christmas category, but I would use it year-round. I think my girly-girl would go crazy for the bubblegum pink personalized hair clip. Thanks Kristi. So cute. I love them all, but my pink-loving daughter would love the "Flower Power Baby Hair Clip, Baby Pink/Fuschia." I loved the Big Sis hair clip, to be worn on right side. Plain cute! We are proud owners of clips from Detail shop and can say they are adorable and we always get many compliments on them when my daughter wears one...love them!! What an ingenious answer to the "which one are you" question. Any of the scalloped personalized clips would be lovely and would help us with this question too. I love the lil sis hair clip, it would be perfect for my niece. I LOVE LOVE LOVE these clips...we have a couple and have nearly worn them out. Seriously, I would take anything she has...they are all WONDERFUL! We don't have a round one so I might choose one of those. This mama is partial to pink and chocolate brown. Love the Polka Dot Hair Clip in Chocolate and Strawberry! Although I'm having "virtual twins", these are adorable and cute and a plus that they are personalized to each kid. Oooh, I like the Lime Green Scalloped Personalized Hair Clip - it's too cute!!! GIGGLE (pink), IMAGINE (lime green) and BELIEVE (purple)..
Love the "Big Sis" clip! I love the flower hair clips with the first letter of their name on it!!! They are all adorable and so unique! I love the believe clip in a beautiful lavendar colour. thanks again Kristi it is so much fun! Oooooooo another fun site - thanks, I'm adding SO many to my favorites :) I love the "giggle, imagine & believe" set ~ they all remind me of my girl ! monogrammed ones are the best! Yet another cute item. Also love the fa la la la clips. I like the ones with the script writing, apple and emma, but again I am NOT entering because I don't trust myself not to put them on the boys. Hard to pick just one, they are all so cute! I like the days of the week, only because knowing Kerri she would mix and match them. Miss Lucy would look absolutely lovely with a Twinkle clip in her hair. I love the Merry Kissmas! What an adorable site. Thanks for introducing me to it. i love the monograms not sure which color i would choose though! Love them all! So hard to pick just one, but I like the scalloped personalized ones, or the round one, or believe or the days of the week........I guess I'll have to choose when I win!!!!!!! Seriously, I love them all. ALL! Even if I don't win, I'm definitely going to order some of these cutie clips! Anything pink! So girly. Thanks for sharing these. Very cute! We love anything pink or purple around here! Monogramed clips are so sweet! Those are AWESOME! I have always wanted one. I was just thinking of doing an Etsy search for clippies to put in a certain someone's stocking! Great timing, great stuff! I'd get the Sugar Plum Fairy Polka Dot Round Clip...we have some of the rectangular ones. They are terrific!! Who can pick?!!! I finally decided on "lil sis". Another amazing site. I love the Polka Dot Hair Clip, Lime/Baby Pink/Fuschia. Thank you for entering me in the drawing. Those were fun to look at. If I had to choose, it would be the set of three -- giggle, imagine and believe -- what wonderful words! Kristi, Just have to tell you that I am a 54-year-old twin, and my sweet mama carefully cut felt letters and sewed to the back of sweaters when my sister and I started school many years ago!! This is so cute and reminds me that the "twin" thing has always perplexed teachers!! I am always on the look out for cute clips and I love these. All the pretty colors!!! Love the initial ones! Fa la la la la flower clip is so cute and festive! They are all super cute. But, I think I would have to go with a pink scalloped name clip. Lime green! That's my favorite! I love the round monogrammed ones and the the personalized ones! I like the flower power and birthday girl clips -- so cute! I would have a hard time choosing...that is ok with me! I love them all ! Honestly, these are so cute and original. I love the new Christmas clips. Kate has the name one monogram one and one that says blessed. They are fabulous! I love the Jingle Bell Rockin Felt Flower Hair Clip. These are so cute--I love the Flower Power Baby Hair Clip, Red/Yellow Checks. The scalloped mongrams ones are very cute! I like the crayon hairclip. Polka dot hair clips are a must to any little cutie! 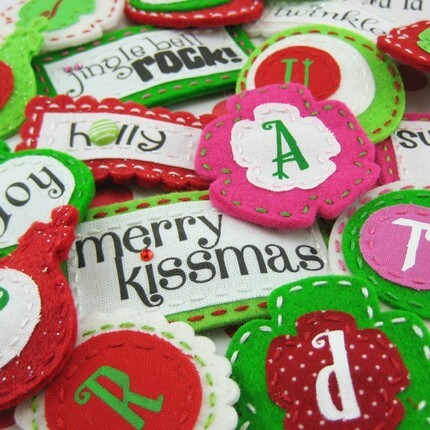 I love the monogramed clips, so sweet!!! I just love them all! Anything pink and personalized would work for us! Love these clips. love the ones with the monograms. Bubble gum pink, with my daughters names on it. So cute. 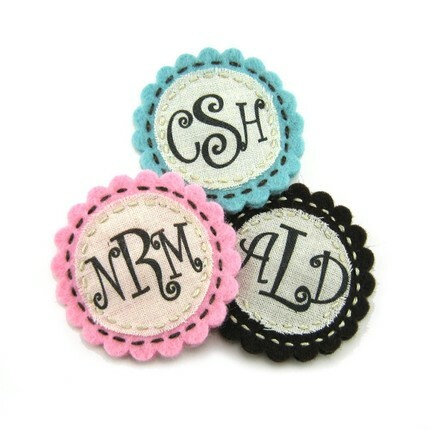 Oh so cute - I would choose the black scalloped personalized hair clip. So sweet!! If I can only get my little gal to keep them in her hair! But these she just might!!!! She would pick anything pink with her name on it! I love the Big Sister OR Lil' Sister Hair Clips, but I can't decide which one because I have 3 girls who would love to wear them! If my name gets drawn I'd like to get the moss green baby hair clip. The Big Sister and Lil' Sister clips would be perfect since we are almost ready to travel to China for our second adoption! All the clips are adorable.